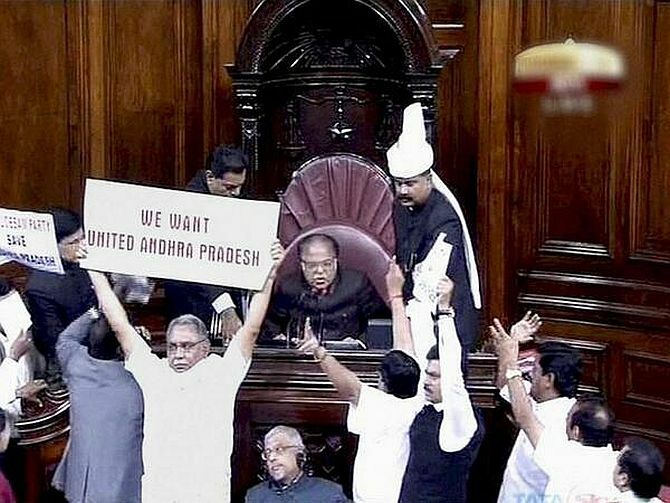 Recently, the Lok Sabha witnessed an unprecedented low when Congress MP from Vijayawada L. Rajagopal used a can of pepper spray to protest against the tabling of the Andhra Pradesh Reorganisation Bill. Three MPs were rushed to hospital as they complained of uneasiness after inhaling pepper spray fumes, while another fainted on the floor of the House after he complained of chest pain. Parliamentary Privilege are the special rights, immunities and exemptions enjoyed by the two houses of Parliament, their committees and their members. Parliamentary privilege extends even to the people who are allowed to take part in the proceedings of any of the two houses of Parliament. (Note: Though President is the integral part of the Parliament, he still does not enjoy the Parliamentary Privileges. Reasons for these Parliamentary Privilege: i) helps to keep the independence and effectiveness of the actions of Parliament ii) also helps to keep the authority, dignity and honour iii) Helps to protect the members of the house from any obstruction in the discharge of their parliamentary responsibilities. No person (either a members or outsider) can be arrested, and no legal process (civil or criminal) can be served within the precints of the House without the permission of the presiding officer. The Courts are prohibited to inquire into the proceedings of a House or its committees. It (House) can institute inquiries and order the attendance of witnesses and send for relevant papers and records. It has the right to receive immediate information of the arrest, detention, conviction, imprisonment and release of a member. It can make rules to regulate its own procedure and the conduct of its business and to adjudicate upon such matters. It can exclude strangers form its proceedings and hold secret sittings to discuss some important matters. It has the right to publish its reports, debates and proceedings and also the right to prohibit others from publishing the same. The 44th Amendment Act of 1978 restored the freedom of the press to publish true reports of parliamentary proceedings without prior permission of the House. But this is not applicable in the case of a secret sitting of the House. They have freedom of speech in Parliament. No members is liable to any proceedings in any court for anything said or any vote given by him in Parliament or its committees. This freedom is subject to the provisions of the Constitution and to the rules and standing orders regulating the procedure of Parliament. They are exempted from jury service. They can refuse to give evidence and appear as a witness in a case pending in a court when Parliament is in session. What is Breach of Privilege? When any individual or authority disregards or attacks any of the privileges, rights and immunities, wither of the members individually or of the House in its collective capacity, the offence is termed as breach of privilege and is punishable by the House. What is Contempt of the House? Any act or omission which obstructs a House of Parliament, its member or its officer in the performance of their functions or which has a tendency, directly or indirectly to produce results against the dignity, authority and honour of the House is treated as a contempt of the House. Are these parliamentary privileges defined under law? According to the Constitution, the powers, privileges and immunities of Parliament and MP’s are to be defined by Parliament. No law has so far been enacted in this respect. In the absence of any such law, it continues to be governed by British Parliamentary conventions. Have there been earlier cases of breach of privilege? There have been several such cases. In 1967, two people were held to be in contempt of Rajya Sabha, for having thrown leaflets from the visitors’ gallery. In 1983, one person was held in breach for shouting slogans and throwing chappals from the visitors’ gallery. What is the punishment in case of breach of privilege or contempt of the House? Originally, the Constitution (Article 105) mentions two privileges, that is, freedom of speech in Parliament and right of publication of its proceedings. Parliament till now has not made any special law to exhaustively codify all the privileges. Various Laws made by Parliament. Its functions are semi-judicial in nature. The function is to examine every question involving breach of privilege of the House or of the members of any Committee thereof referred to it by the House or by the Speaker. It determines with reference to the facts of each case whether a breach of privilege is involved and makes suitable recommendations in its report. The Lok Sabha committee has 15 members (nominated by Speaker of the Lok Sabha), while the Rajya Sabha committee has 10 members (nominated by Chairman of the Rajya Sabha). There is no definite term for this committee. Once appointed it remains in its place, till it is reconstituted. It is concerned with the breach of parliamentary privileges by a minister. It is moved by a member when he feels that a minister has committed a breach of privilege of the House or one or more of its members by withholding facts of a case or by giving wrong or distorted facts. Its purpose is to censure the concerned minister. thereof, and no person shall be so liable in respect of the publication by or under the authority of either House of Parliament of any report, paper, votes or proceedings. Constitution have the right to speak in, and otherwise to take part in the proceedings of, a House of Parliament or any committee thereof as they apply in relation to members of Parliament. A member may, with the consent of the Speaker, raise a question involving a breach of privilege either of a member or of the House or of a Committee thereof. A member wishing to raise a question of privilege shall give notice in writing to the Secretary-General on the day the question is proposed to be raised. If the question raised is based on a document, the notice shall be accompanied by the document. (iii) the matter requires the intervention of the House. Provided that where the Speaker has refused his consent under rule 222 or is of opinion that the matter proposed to be discussed is not in order, he may, if he thinks it necessary, read the notice of question of privilege and state that he refuses consent or holds that the notice of question of privilege is not in order: Provided further that the Speaker may, if he is satisfied about the urgency of the matter, allow a question of privilege to be raised at any time during the course of a sitting after the disposal of questions. (2) If objection to leave being granted is taken, the Speaker shall request those members who are in favour of leave being granted to rise in their places, and if not less than twenty-five members rise accordingly, the Speaker shall declare that leave is granted. If less than twenty-five members rise, the Speaker shall inform the member that he has not the leave of the House. If leave under rule 225 is granted, the House may consider the question and come to a decision or refer it to a Committee of Privileges on a motion made either by the member who has raised the question of privilege or by any other member. Notwithstanding anything contained in these rules, the Speaker may refer any question of privilege to the Committee of Privileges for examination, investigation or report. The Speaker may issue such directions as may be necessary for regulating the procedure in connection with all matters connected with the consideration of the question of privilege either in the Committee of Privileges or in the House. Which Rule Number of Rules of Procedure was used to deal with this situation? Speaker of Lok Sabha used Rule Number 227 of the Rules of Procedure against the situation that aroused due to the pepper spray in the Lok Sabha. Which of the following state/s has/have no Lok Sabha constituency reserved for ST?